The term birth-related brachial plexus palsy (BRBPP) refers to injury noted in the perinatal period to all or a portion of the brachial plexus. [1, 2] The term obstetrical brachial plexus palsy (OBPP) has also been used but has negative implications; accordingly, other terms, such as birth-related brachial plexus injury (BRBPI), are often preferred, particularly in the United States. Injuries associated with the upper brachial plexus are classically termed Erb palsies, and those associated with the lower plexus are traditionally termed Klumpke palsies. Management of children with BRBPP remains challenging. Technological and surgical advancements have improved patient outcomes, but room for improvement remains. Previous controversy regarding surgical timing has been replaced with evidenced-based results. Outcomes analysis would benefit from a universal outcome measurement tool to allow comparison among institutions. Given the small number of patients who require surgical management, meta-analyses would allow better trend analysis. Continued experience with direct nerve transfers may eventually minimize interpositional grafting procedures. Basic science research continues for methods of enhancing peripheral nerve regeneration and target muscle protection. The future of management of patients with OBPP continues to benefit from a multidisciplinary approach for delineating optimal treatment methods. Schema of the brachial plexus. BRBPP arises from an increase in the infant’s neck-shoulder angle, which results in a traction force to the brachial plexus. [14, 15] This force on the brachial plexus can cause varying degrees of nerve injury, ranging from neurapraxia to complete root avulsion. Clinically, this injury results in disruption of the sensory and motor function of the injured nerve. Seddon and Sunderland each described a classification for nerve injuries. [16, 17] The classification of nerve injury described by Seddon consisted of neurapraxia, axonotmesis, and neurotmesis. Sunderland expanded the classification system into five degrees of nerve injury, as follows. A first-degree injury, or neurapraxia, involves a temporary conduction block with demyelination of the nerve at the site of injury. Electrodiagnostic studies elicit normal results above and below the level of injury, and no denervation changes are present within the muscle. No Tinel sign is present. Once the nerve has remyelinated at that area, complete recovery occurs. Recovery may take up to 12 weeks. A second-degree injury, or axonotmesis, results from a more severe trauma or compression. This causes Wallerian degeneration distal to the level of injury and proximal axonal degeneration to at least the next node of Ranvier. In more severe traumatic injuries, the proximal degeneration may extend beyond the next node of Ranvier. Electrodiagnostic studies demonstrate denervation changes in the affected muscle(s), and in cases of reinnervation, motor unit potentials (MUPs) are present. Axonal regeneration after second-degree injury occurs at a rate of 1 mm/day or 1 in./month and can be followed with an advancing Tinel sign. The endoneurial tubes remain intact, and the recovery, therefore, is complete with axons reinnervating their original motor and sensory targets. A third-degree injury, introduced by Sunderland, is similar to second-degree injury in that Wallerian degeneration occurs; electrodiagnostic studies demonstrate denervation changes with fibrillations in affected muscles. In reinnervation, MUPs are present. Regeneration occurs at a rate of 1 mm/day, and progress may be followed with an advancing Tinel sign. With the increased severity of the injury, the endoneurial tubes are not intact, thus the regenerating axons may not reinnervate their original motor and sensory targets. The pattern of recovery after third-degree injury is mixed and incomplete. Reinnervation occurs only if sensory fibers reach their sensory end organs and motor fibers reach their muscle targets. Even within a sensory nerve, recovery can be mismatched if sensory fibers reinnervate a different sensory area within the nerve's sensory distribution. If the muscle target is far from the site of injury, nerve regeneration may occur, but the muscle may not be reinnervated completely, due to the long period of denervation. A fourth-degree injury results in a large area of scar at the site of nerve injury and precludes any axons from advancing distal to the level of nerve injury. Electrodiagnostic studies reveal denervation changes in the affected muscles, and no MUPs are present. A Tinel sign is noted at the level of the injury, but it does not advance beyond that level. No improvement in function is noted, and the patient requires surgery to restore neural continuity, thus permitting axonal regeneration and motor and sensory reinnervation. A fifth-degree injury is a complete transection of the nerve. As with a fourth-degree injury, surgery is required to restore neural continuity. Electrodiagnostic findings are the same as those for a fourth-degree injury. Mackinnon popularized a sixth-degree injury classification to describe a mixed-nerve injury with a combination of the other degrees of injury in one patient. This injury pattern commonly occurs when some fascicles of the nerve are working normally while other fascicles may be recovering. Other fascicles may require surgical intervention to permit axonal regeneration. Spontaneous recovery may occur with Sunderland type I, II, +/- III injuries. In cases of severe nerve injury (Sunderland III, IV, or V) and /or avulsion, however, spontaneous recovery does not occur, and surgical intervention is warranted. BRBPI may result from a multitude of causes. Positioning may lead to an increase in the neck-shoulder angle, producing a stretch injury, rupture, or avulsion if forces exceed neural tensile strength. Injury may also result from compression due to hematoma, clavicular fracture, uterine contraction, or instrumentation or manipulation. Vertex presentation accounts for most BRBPP cases (94-97%); breech presentations account for 1-2% of cases; and cesarean deliveries account for 1% of cases. Mothers with diabetes, obesity, or preeclampsia, as well as mothers who are multiparous and previously had large babies, are also considered to be at higher risk for their children to have BRBPP. BRBPIs occur in 0.5-5 infants per 1000 live births. [26, 25, 32] The incidence ranges globally from 0.2% to 4% of live births. According to the World Health Organization, prevalence is generally 1-2% worldwide, with the higher numbers being in underdeveloped countries. Most patients with BRBPP recover spontaneously and do not require surgical intervention. For those patients with more severe neural injuries requiring surgical management, outcomes are hopeful. The assessment of clinical functional outcomes, however, is limited by the lack of a universal outcome measure in the evaluation of patients with BRBPP. The Brachial Plexus Outcome Measure has been proposed as an effective and consistent outcome assessment tool. Different centers use different scales for evaluation of motor function, change scales depending on patient age, use different scales for different body regions, use two scales to describe motion and strength, or describe range of motion as degrees of joint angle, limiting the capacity for comparison studies or meta-analyses. The Canadian OBPI Working Group published a meta-analysis, however, comparing outcomes of children younger than 2 years who underwent either operative nerve repair or nonoperative management of BRBPP. Nerve repair reduced functional impairment significantly as compared with nonoperative management. In 222 patients, there were no deaths, major adverse events occurred in 1.5%, and minor adverse events occurred in 5%. With nonoperative management, 27% of patients exhibited residual impairment. With neuroma excision and grafting, reported outcomes demonstrate a relationship with the extent of the brachial plexus lesion. O’Brien et al  reviewed their series of 52 patients with BRBPP treated with brachial plexus neuroma resection and interpositional sural nerve grafting at an average age of 9.8 months. A Medical Research Council score of greater than or equal to 3/5 was demonstrated in the setting of C5-C6 injury in biceps function in 92% of children, triceps function in 92%, and deltoid function in 83%. In the setting of C5-C7 injuries, children scored greater than or equal to 3/5 on the Medical Research Council scale in the biceps in 76%, triceps in 76%, and deltoid in 72%. Children with a C5-C8 and T1 lesion achieved and Medical Research Council score greater than 3/5 in the biceps in 73%, triceps in 53%, and deltoid in 67%. Gilbert et al  reported their 20-year experience with neuroma excision and grafting in patients with no biceps function by age 3 months. They reported “good or excellent” shoulder function after 4-year follow-up in 80% of children that had C5-C6 lesions. Only 61% of patients achieved this function with C5-C7 injuries. Children with complete brachial plexus lesions achieved “average, good, or excellent results” in 77% of cases at 8 years postoperatively. They reported better outcomes in elbow function, with 81% of children achieving “good or excellent” results at 8 years. Hand function was reported as “useful” in 76% of children. AFter reconstruction with neurolysis, neuroma excision and grafting, and/or nerve transfers, El-Gammal et al  reported good or excellent outcomes for elbow flexion and extension in 77% of children, but they reported achieving this same level of function for thumb extension in only 28% of patients and for wrist extension in only 31% of patients. Similarly, Terzis and Kostas  saw no significant differences in outcome in patients undergoing suprascapular nerve reconstruction via either direct neurotization (spinal accessory or intraplexus) or nerve graft. They reported good or excellent results in supraspinatus function in 96% of patients and in infraspinatus function in 75%. Forty-one of 50 patients achieved Mallet grade III or IV external shoulder rotation, and the authors described a trend towards increased range of shoulder abduction in patients with direct nerve transfers. Pondaag et al  also found no differences in glenohumeral rotation, passive external rotation, and Mallet hand-to-head movement after nerve transfer versus grafting. Intercostal nerve transfers to the musculocutaneous nerve resulted in Medical Research Council grade M4 biceps function in 84%  and good or excellent elbow flexion in 93.5%. Oberlin transfer was reported to achieve Medical Research Council grade M4 or M5 biceps function in 4 of 7 patients  and Medical Research Council grade M5 in two of two patients  in separate studies. Secondary surgical procedures involving tendon and muscle transfers and releases are available to patients with functional limitations. [51, 52] Limited shoulder function can be enhanced at a later age with procedures to release the subscapularis muscle or transfer the teres major and latissimus dorsi muscles. [53, 54, 55, 56] Recovery of elbow flexion can be augmented at a later date, if necessary, with muscle or tendon transfers. Birch R. Birth lesions of the brachial plexus. Surgical Disorders of the Peripheral Nerves. 2nd ed. London: Springer; 2011. 429-79. Omer GE Jr, Spinner M, Van Beek AL. Management of Peripheral Nerve Problems. 2nd ed. Philadelphia: WB Saunders; 1998. Phua PD, Al-Samkari HT, Borschel GH. Is the term "obstetrical brachial plexus palsy" obsolete? An international survey to assess consensus among peripheral nerve surgeons. J Plast Reconstr Aesthet Surg. 2012 Sep. 65 (9):1227-32. [Medline]. Smellie W. A Collection of Cases and Observations in Midwifery. To Illustrate His former Treatise, or First Volume, on that Subject. 4th ed. London: 1768. Vol 2: 334-42. Duchenne GA. De l'Électrisation Localisée et de Son Application à la Pathologie et à la Thérapeutique par Courants Induits et par Courants Galvaniques Interrompus et Continus. 3rd ed. Paris: Librairie J. B. Baillière et Fils; 1872. Erb W. Ueber eine eigenthümliche Localisation von Lähmungen im Plexus brachialis. Verhandlungen. Naturhistorisch-medizinischer Verein. Heidelberg 2: 130-136, 1874. Kennedy R. SUTURE of the BRACHIAL PLEXUS in BIRTH PARALYSIS of the UPPER EXTREMITY. Br Med J. 1903 Feb 7. 1 (2197):298-301. [Medline]. [Full Text]. Sever JW. Obstetric paralysis. Report of eleven hundred cases. JAMA. 1925. 85:1862-1865. Sever JW. Obstetric paralysis: Its etiology, pathology, clinical aspects and treatment, with a report of four hundred and seventy cases. Am J Dis Child. 1916. 12:541-78. Gilbert A, Tassin JL. Obstetrical palsy: a clinical, pathologic, and surgical review. Terzis JK, ed. Microreconstruction of Nerve Injuries. WB Saunders: Philadelphia; 1987. 529-53. Gilbert A. Obstetrical brachial plexus palsy. Tubiana R, ed. The Hand. Philadelphia: WB Saunders; 1993. Vol 4: 575-601. Kattan AE, Borschel GH. 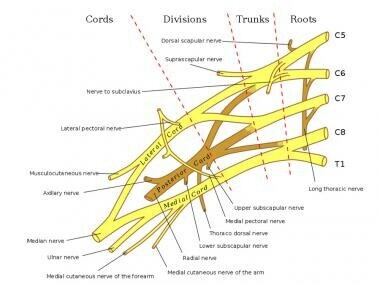 Anatomy of the brachial plexus. J Pediatr Rehabil Med. 2011. 4(2):107-11. [Medline]. Arad E, Li Z, Sitzman TJ, Agur AM, Clarke HM. Anatomic sites of origin of the suprascapular and lateral pectoral nerves within the brachial plexus. Plast Reconstr Surg. 2014 Jan. 133(1):20e-7e. [Medline]. Al-Qattan MM, El-Sayed AA, Al-Zahrani AY, et al. Obstetric brachial plexus palsy: a comparison of affected infants delivered vaginally by breech or cephalic presentation. J Hand Surg Eur Vol. 2010 Jun. 35(5):366-9. [Medline]. SUNDERLAND S. A classification of peripheral nerve injuries producing loss of function. Brain. 1951 Dec. 74 (4):491-516. [Medline]. Mackinnon SE, Dellon AL. Surgery of the Peripheral Nerve. New York: Thieme; 1988. Iorio ML, Menashe SJ, Iyer RS, Lewis SP, Steinman S, Whitlock KB, et al. Glenohumeral Dysplasia Following Neonatal Brachial Plexus Palsy: Presentation and Predictive Features During Infancy. J Hand Surg Am. 2015 Dec. 40 (12):2345-51.e1. [Medline]. Moukoko D, Ezaki M, Wilkes D, Carter P. Posterior shoulder dislocation in infants with neonatal brachial plexus palsy. J Bone Joint Surg Am. 2004 Apr. 86-A (4):787-93. [Medline]. Brochard S, Mozingo JD, Alter KE, Sheehan FT. Three dimensionality of gleno-humeral deformities in obstetrical brachial plexus palsy. J Orthop Res. 2016 Apr. 34 (4):675-82. [Medline]. Waters PM, Smith GR, Jaramillo D. Glenohumeral deformity secondary to brachial plexus birth palsy. J Bone Joint Surg Am. 1998 May. 80 (5):668-77. [Medline]. Lindqvist PG, Ajne G, Cooray C, Erichs K, Gudmundsson S, Dahlin LB. Identification of pregnancies at increased risk of brachial plexus birth palsy - the construction of a weighted risk score. J Matern Fetal Neonatal Med. 2014 Feb. 27(3):252-6. [Medline]. Lindqvist PG, Erichs K, Molnar C, Gudmundsson S, Dahlin LB. Characteristics and outcome of brachial plexus birth palsy in neonates. Acta Paediatr. 2012 Jun. 101(6):579-82. [Medline]. Volpe KA, Snowden JM, Cheng YW, Caughey AB. Risk factors for brachial plexus injury in a large cohort with shoulder dystocia. Arch Gynecol Obstet. 2016 Nov. 294 (5):925-929. [Medline]. Al-Qattan MM. Obstetric brachial plexus palsy associated with breech delivery. Ann Plast Surg. 2003 Sep. 51(3):257-64; discussion 265. [Medline]. Gherman RB, Ouzounian JG, Satin AJ, Goodwin TM, Phelan JP. A comparison of shoulder dystocia-associated transient and permanent brachial plexus palsies. Obstet Gynecol. 2003 Sep. 102(3):544-8. [Medline]. Moczygemba CK, Paramsothy P, Meikle S, et al. Route of delivery and neonatal birth trauma. Am J Obstet Gynecol. 2010 Apr. 202(4):361.e1-6. [Medline]. Doumouchtsis SK, Arulkumaran S. Are all brachial plexus injuries caused by shoulder dystocia?. Obstet Gynecol Surv. 2009 Sep. 64(9):615-23. [Medline]. Coroneos CJ, Voineskos SH, Coroneos MK, Alolabi N, Goekjian SR, Willoughby LI, et al. Obstetrical brachial plexus injury: burden in a publicly funded, universal healthcare system. J Neurosurg Pediatr. 2015 Oct 23. 1-8. [Medline]. Chauhan SP, Laye MR, Lutgendorf M, McBurney JW, Keiser SD, Magann EF, et al. A multicenter assessment of 1,177 cases of shoulder dystocia: lessons learned. Am J Perinatol. 2014 May. 31 (5):401-6. [Medline]. El-Sayed AA. Obstetric brachial plexus palsy following routine versus difficult deliveries. J Child Neurol. 2014 Jul. 29 (7):920-3. [Medline]. Chang KW, Ankumah NA, Wilson TJ, Yang LJ, Chauhan SP. Persistence of Neonatal Brachial Plexus Palsy Associated with Maternally Reported Route of Delivery: Review of 387 Cases. Am J Perinatol. 2016 Jul. 33 (8):765-9. [Medline]. Wilson TJ, Chang KW, Chauhan SP, Yang LJ. Peripartum and neonatal factors associated with the persistence of neonatal brachial plexus palsy at 1 year: a review of 382 cases. J Neurosurg Pediatr. 2016 May. 17 (5):618-24. [Medline]. Gonik B, Walker A, Grimm M. Mathematic modeling of forces associated with shoulder dystocia: a comparison of endogenous and exogenous sources. Am J Obstet Gynecol. 2000 Mar. 182(3):689-91. [Medline]. Ho ES, Curtis CG, Clarke HM. The brachial plexus outcome measure: development, internal consistency, and construct validity. J Hand Ther. 2012 Oct-Dec. 25(4):406-16; quiz 417. [Medline]. Coroneos CJ, Voineskos SH, Coroneos MK, Alolabi N, Goekjian SR, Willoughby LI, et al. Primary Nerve Repair for Obstetrical Brachial Plexus Injury: A Meta-Analysis. Plast Reconstr Surg. 2015 Oct. 136 (4):765-79. [Medline]. O'Brien DF, Park TS, Noetzel MJ, Weatherly T. Management of birth brachial plexus palsy. Childs Nerv Syst. 2006 Feb. 22(2):103-12. [Medline]. Gilbert A, Pivato G, Kheiralla T. Long-term results of primary repair of brachial plexus lesions in children. Microsurgery. 2006. 26(4):334-42. [Medline]. El-Gammal TA, El-Sayed A, Kotb MM, et al. Total obstetric brachial plexus palsy: results and strategy of microsurgical reconstruction. Microsurgery. 2010. 30(3):169-78. [Medline]. Tse R, Marcus JR, Curtis CG, Dupuis A, Clarke HM. Suprascapular nerve reconstruction in obstetrical brachial plexus palsy: spinal accessory nerve transfer versus C5 root grafting. Plast Reconstr Surg. 2011 Jun. 127(6):2391-6. [Medline]. Terzis JK, Kostas I. Outcomes with suprascapular nerve reconstruction in obstetrical brachial plexus patients. Plast Reconstr Surg. 2008 Apr. 121(4):1267-78. [Medline]. Pondaag W, de Boer R, van Wijlen-Hempel MS, Hofstede-Buitenhuis SM, Malessy MJ. External rotation as a result of suprascapular nerve neurotization in obstetric brachial plexus lesions. Neurosurgery. 2005 Sep. 57(3):530-7; discussion 530-7. [Medline]. van Ouwerkerk WJ, Uitdehaag BM, Strijers RL, et al. Accessory nerve to suprascapular nerve transfer to restore shoulder exorotation in otherwise spontaneously recovered obstetric brachial plexus lesions. Neurosurgery. 2006 Oct. 59(4):858-67; discussion 867-9. [Medline]. Kawabata H, Shibata T, Matsui Y, Yasui N. Use of intercostal nerves for neurotization of the musculocutaneous nerve in infants with birth-related brachial plexus palsy. J Neurosurg. 2001 Mar. 94(3):386-91. [Medline]. El-Gammal TA, Abdel-Latif MM, Kotb MM, et al. Intercostal nerve transfer in infants with obstetric brachial plexus palsy. Microsurgery. 2008. 28(7):499-504. [Medline]. Noaman HH, Shiha AE, Bahm J. Oberlin's ulnar nerve transfer to the biceps motor nerve in obstetric brachial plexus palsy: indications, and good and bad results. Microsurgery. 2004. 24(3):182-7. [Medline]. Al-Qattan MM. Oberlin's ulnar nerve transfer to the biceps nerve in Erb's birth palsy. Plast Reconstr Surg. 2002 Jan. 109(1):405-7. [Medline]. Gilbert A. Long-term evaluation of brachial plexus surgery in obstetrical palsy. Hand Clin. 1995 Nov. 11(4):583-94; discussion 594-5. [Medline]. Price AE, Grossman JA. A management approach for secondary shoulder and forearm deformities following obstetrical brachial plexus injury. Hand Clin. 1995 Nov. 11(4):607-17. [Medline]. Nath RK, Paizi M. Improvement in abduction of the shoulder after reconstructive soft-tissue procedures in obstetric brachial plexus palsy. J Bone Joint Surg Br. 2007 May. 89(5):620-6. [Medline]. Ozben H, Atalar AC, Bilsel K, Demirhan M. Transfer of latissmus dorsi and teres major tendons without subscapularis release for the treatment of obstetrical brachial plexus palsy sequela. J Shoulder Elbow Surg. 2011 Dec. 20(8):1265-74. [Medline]. Chomiak J, Dungl P, Oštádal M, Frydrychová M, Burian M. Muscle transfers in children and adults improve external rotation in cases of obstetrical brachial plexus paralysis: a comparative study. Int Orthop. 2014 Apr. 38(4):803-10. [Medline]. Murabit A, Gnarra M, O'Grady K, Morhart M, Olson JL. Functional outcome after the Hoffer procedure. Plast Reconstr Surg. 2013 Jun. 131(6):1300-6. [Medline]. Bain JR, DeMatteo C, Gjertsen D, Packham T, Galea V, Harper JA. Limb length differences after obstetrical brachial plexus injury: a growing concern. Plast Reconstr Surg. 2012 Oct. 130(4):558e-571e. [Medline]. Oktay F, Cömert D, Gökkaya NK, Ozbudak SD, Uysal H. Bone age in children with obstetrical brachial plexus palsy: effect of peripheral nerve injury on skeletal maturation. J Child Neurol. 2014 Feb. 29(2):203-9. [Medline]. Akel BS, Öksüz Ç, Oskay D, Firat T, Tarakci E, Leblebicioglu G. Health-related quality of life in children with obstetrical brachial plexus palsy. Qual Life Res. 2013 Nov. 22(9):2617-24. [Medline]. Alyanak B, Kilinçaslan A, Kutlu L, Bozkurt H, Aydin A. Psychological adjustment, maternal distress, and family functioning in children with obstetrical brachial plexus palsy. J Hand Surg Am. 2013 Jan. 38(1):137-42. [Medline]. Ho ES, Curtis CG, Clarke HM. Pain in children following microsurgical reconstruction for obstetrical brachial plexus palsy. J Hand Surg Am. 2015 Jun. 40 (6):1177-83. [Medline]. Bae DS, Zurakowski D, Avallone N, Yu R, Waters PM. Sports participation in selected children with brachial plexus birth palsy. J Pediatr Orthop. 2009 Jul-Aug. 29(5):496-503. [Medline]. Ho ES, Curtis CG, Clarke HM. Pediatric Evaluation of Disability Inventory: its application to children with obstetric brachial plexus palsy. J Hand Surg Am. 2006 Feb. 31(2):197-202. [Medline]. Al-Qattan MM, Clarke HM, Curtis CG. Klumpke's birth palsy. Does it really exist?. J Hand Surg Br. 1995 Feb. 20(1):19-23. [Medline]. Curtis C, Stephens D, Clarke HM, Andrews D. The active movement scale: an evaluative tool for infants with obstetrical brachial plexus palsy. J Hand Surg Am. 2002 May. 27(3):470-8. [Medline]. British Medical Research Council. Aids to the investigation of peripheral nerve injuries. London: His Majesty’s Stationary Office; 1943. Mallet J. Paralysie obstétricale du plexus brachial. Traitement des séquelles. Primauté du traitement de l'épaule. — Méthode d'expression des résultats. Revue de chirurgie orthopedique et reparatrice de l'appareil moteur. 1972. 58;Suppl 1:166-8. Borschel GH, Clarke HM. Obstetrical brachial plexus palsy. Plast Reconstr Surg. 2009 Jul. 124(1 Suppl):144e-155e. [Medline]. Al-Qattan MM, El-Sayed AA. Obstetric brachial plexus palsy: the mallet grading system for shoulder function--revisited. Biomed Res Int. 2014. 2014:398121. [Medline]. [Full Text]. Eismann EA, Laor T, Cornwall R. Three-Dimensional Magnetic Resonance Imaging of Glenohumeral Dysplasia in Neonatal Brachial Plexus Palsy. J Bone Joint Surg Am. 2016 Jan 20. 98 (2):142-51. [Medline]. Donohue KW, Little KJ, Gaughan JP, Kozin SH, Norton BD, Zlotolow DA. Comparison of Ultrasound and MRI for the Diagnosis of Glenohumeral Dysplasia in Brachial Plexus Birth Palsy. J Bone Joint Surg Am. 2017 Jan 18. 99 (2):123-132. [Medline]. Sheehan FT, Brochard S, Behnam AJ, Alter KE. Three-dimensional humeral morphologic alterations and atrophy associated with obstetrical brachial plexus palsy. J Shoulder Elbow Surg. 2014 May. 23 (5):708-19. [Medline]. Heise CO, Siqueira MG, Martins RS, Gherpelli JL. Clinical-electromyography correlation in infants with obstetric brachial plexopathy. J Hand Surg Am. 2007 Sep. 32(7):999-1004. [Medline]. Gordon M, Rich H, Deutschberger J, Green M. The immediate and long-term outcome of obstetric birth trauma. I. Brachial plexus paralysis. Am J Obstet Gynecol. 1973 Sep 1. 117(1):51-6. [Medline]. Gilbert A, Tassin JL. [Surgical repair of the brachial plexus in obstetric paralysis]. Chirurgie. 1984. 110(1):70-5. [Medline]. Gilbert A, Whitaker I. Obstetrical brachial plexus lesions. J Hand Surg Br. 1991 Dec. 16(5):489-91. [Medline]. Hale HB, Bae DS, Waters PM. Current concepts in the management of brachial plexus birth palsy. J Hand Surg Am. 2010 Feb. 35(2):322-31. [Medline]. Fisher DM, Borschel GH, Curtis CG, Clarke HM. Evaluation of elbow flexion as a predictor of outcome in obstetrical brachial plexus palsy. Plast Reconstr Surg. 2007 Nov. 120(6):1585-90. [Medline]. Bade SA, Lin JC, Curtis CG, Clarke HM. Extending the indications for primary nerve surgery in obstetrical brachial plexus palsy. Biomed Res Int. 2014. 2014:627067. [Medline]. [Full Text]. El-Sayed AA. The prognostic value of concurrent Horner syndrome in extended Erb obstetric brachial plexus palsy. J Child Neurol. 2014 Oct. 29 (10):1356-9. [Medline]. Argenta AE, Brooker J, MacIssac Z, Natali M, Greene S, Stanger M, et al. Obstetrical brachial plexus palsy: Can excision of upper trunk neuroma and nerve grafting improve function in babies with adequate elbow flexion at nine months of age?. J Plast Reconstr Aesthet Surg. 2016 May. 69 (5):629-33. [Medline]. Malessy MJ, Pondaag W, van Dijk JG. Electromyography, nerve action potential, and compound motor action potentials in obstetric brachial plexus lesions: validation in the absence of a "gold standard". Neurosurgery. 2009 Oct. 65(4 Suppl):A153-9. [Medline]. Ezaki M, Malungpaishrope K, Harrison RJ, Mills JK, Oishi SN, Delgado M, et al. Onabotulinum toxinA injection as an adjunct in the treatment of posterior shoulder subluxation in neonatal brachial plexus palsy. J Bone Joint Surg Am. 2010 Sep 15. 92 (12):2171-7. [Medline]. Clarke HM, Al-Qattan MM, Curtis CG, Zuker RM. Obstetrical brachial plexus palsy: results following neurolysis of conducting neuromas-in-continuity. Plast Reconstr Surg. 1996 Apr. 97(5):974-82; discussion 983-4. [Medline]. Capek L, Clarke HM, Curtis CG. Neuroma-in-continuity resection: early outcome in obstetrical brachial plexus palsy. Plast Reconstr Surg. 1998 Oct. 102(5):1555-62; discussion 1563-4. [Medline]. Lin JC, Schwentker-Colizza A, Curtis CG, Clarke HM. Final results of grafting versus neurolysis in obstetrical brachial plexus palsy. Plast Reconstr Surg. 2009 Mar. 123(3):939-48. [Medline]. Lapid O, Ho ES, Goia C, Clarke HM. Evaluation of the sensory deficit after sural nerve harvesting in pediatric patients. Plast Reconstr Surg. 2007 Feb. 119(2):670-4. [Medline]. Davidge KM, Clarke HM, Borschel GH. Nerve Transfers in Birth Related Brachial Plexus Injuries: Where Do We Stand?. Hand Clin. 2016 May. 32 (2):175-90. [Medline]. Tse R, Kozin SH, Malessy MJ, Clarke HM. International Federation of Societies for Surgery of the Hand Committee report: the role of nerve transfers in the treatment of neonatal brachial plexus palsy. J Hand Surg Am. 2015 Jun. 40 (6):1246-59. [Medline]. Clarke HM, Curtis CG. An approach to obstetrical brachial plexus injuries. Hand Clin. 1995 Nov. 11(4):563-80; discussion 580-1. [Medline]. Kawabata H, Kawai H, Masatomi T, Yasui N. Accessory nerve neurotization in infants with brachial plexus birth palsy. Microsurgery. 1994. 15(11):768-72. [Medline]. Bahm J, Noaman H, Becker M. The dorsal approach to the suprascapular nerve in neuromuscular reanimation for obstetric brachial plexus lesions. Plast Reconstr Surg. 2005 Jan. 115(1):240-4. [Medline]. Colbert SH, Mackinnon SE. Nerve transfers for brachial plexus reconstruction. Hand Clin. 2008 Nov. 24(4):341-61, v. [Medline]. Humphreys DB, Mackinnon SE. Nerve transfers. Oper Tech Plast Reconstr Surg. 2002. 9 (3):89-99. Figueiredo Rde M, Grechi G, Gepp Rde A. Oberlin's procedure in children with obstetric brachial plexus palsy. Childs Nerv Syst. 2016 Jun. 32 (6):1085-91. [Medline]. Blaauw G, Slooff AC. Transfer of pectoral nerves to the musculocutaneous nerve in obstetric upper brachial plexus palsy. Neurosurgery. 2003 Aug. 53(2):338-41; discussion 341-2. [Medline]. Ladak A, Morhart M, O'Grady K, Wong JN, Chan KM, Watt MJ, et al. Distal nerve transfers are effective in treating patients with upper trunk obstetrical brachial plexus injuries: an early experience. Plast Reconstr Surg. 2013 Dec. 132(6):985e-92e. [Medline]. Gibon E, Romana C, Vialle R, Fitoussi F. Isolated C5-C6 avulsion in obstetric brachial plexus palsy treated by ipsilateral C7 neurotization to the upper trunk: outcomes at a mean follow-up of 9 years. J Hand Surg Eur Vol. 2016 Feb. 41 (2):185-90. [Medline]. Romana C, Gibon E, Vialle R. Total ipsilateral C7 root neurotization to the upper trunk for isolated C5-C6 avulsion in obstetrical brachial plexus palsy: a preliminary technical report. Childs Nerv Syst. 2014 May. 30 (5):931-5. [Medline]. Chen L, Gu YD, Hu SN, et al. Contralateral C7 transfer for the treatment of brachial plexus root avulsions in children - a report of 12 cases. J Hand Surg Am. 2007 Jan. 32(1):96-103. [Medline]. Blaauw G, Sauter Y, Lacroix CL, Slooff AC. Hypoglossal nerve transfer in obstetric brachial plexus palsy. J Plast Reconstr Aesthet Surg. 2006. 59(5):474-8. [Medline]. Xu J, Cheng X, Dong Z, Gu Y. Remote therapeutic effect of early nerve transposition in treatment of obstetrical brachial plexus palsy. Chin J Traumatol. 2001 Feb. 4(1):40-3. [Medline]. Al-Qattan MM, El-Sayed AA. The use of the phrenic nerve communicating branch to the fifth cervical root for nerve transfer to the suprascapular nerve in infants with obstetric brachial plexus palsy. Biomed Res Int. 2014. 2014:153182. [Medline]. Arad E, Stephens D, Curtis CG, Clarke HM. Botulinum toxin for the treatment of motor imbalance in obstetrical brachial plexus palsy. Plast Reconstr Surg. 2013 Jun. 131(6):1307-15. [Medline]. The authors and editors of Medscape Reference gratefully acknowledge the contributions of previous authors, Christine B Novak, PT, MS, and Mark E Baratz, MD, to the development and writing of this article. Are Current Measures of Neonatal Birth Trauma Valid Indicators of Quality of Care?